The manager has put you in charge of converting inch to feet using the Junk Converter machine. Inch to feet conversion is one of the way to sort out the discarded items. Once you have done the conversion, register it into the system by tapping on the scroll bars individually and forming the amount that you need. 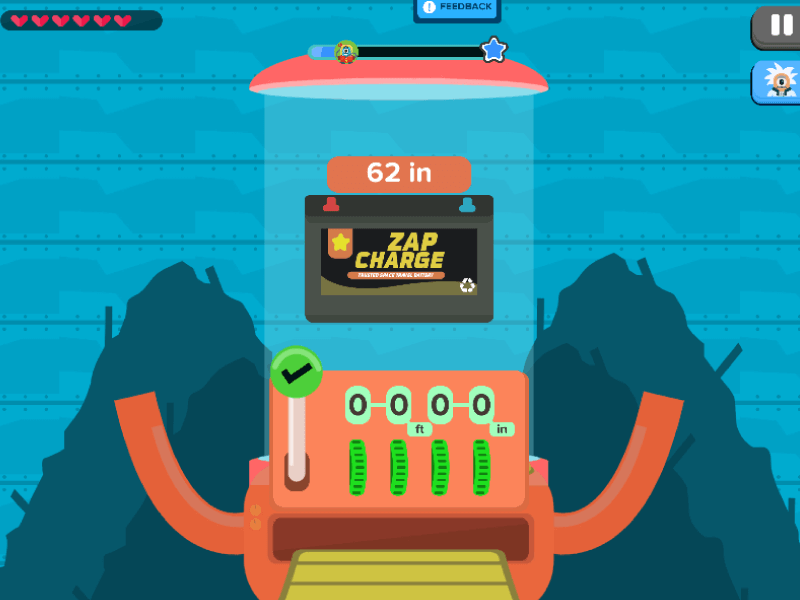 Pull the green lever to enter the amount. The right answer will produce great and useful items for daily use, such as new batteries and phone sim cards. The wrong answer, however, will cause the Junk Converter to crash. Do not worry; a maintenance team is close by to fix the machine so that you can try again! Junk Converter is a game that trains your conversion skills within a measurement system, such as centimeters to meters, or inches to feet. Conversion can be tricky because each unit of measurement has a distinctive method of translating, therefore it is key to constantly notice the difference and practice the conversion. The recurring pattern of observation in each conversion allows for you to get acquainted with the act of successfully identifying and deciphering from one standard measurement unit, to another. Convert and recycle in one swift motion!